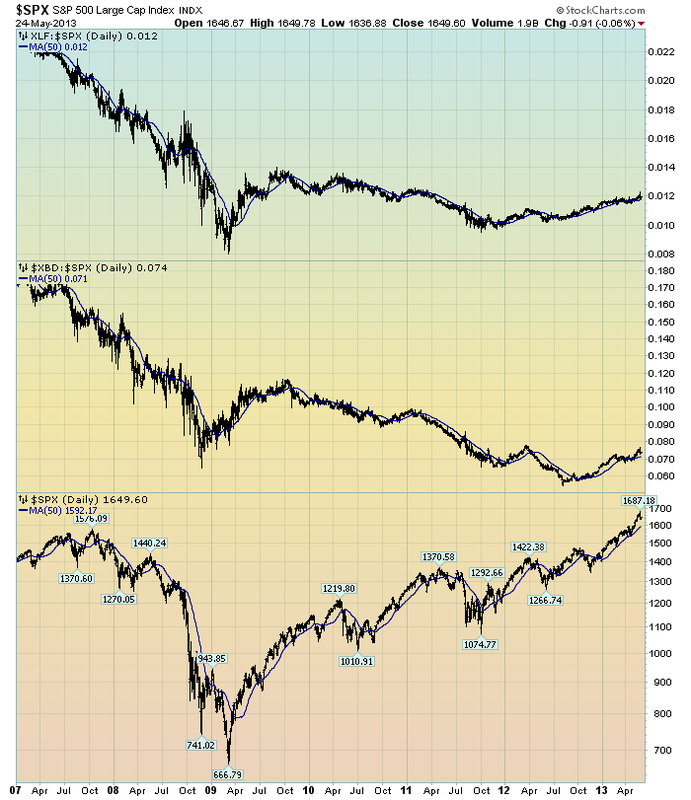 Below are three long-term charts, from Doug Short’s blog post of May 31 titled “ECRI Recession Watch: ‘What Wealth Effect?’” These charts are on a weekly basis through the May 31 release, indicating data through May 24, 2013. 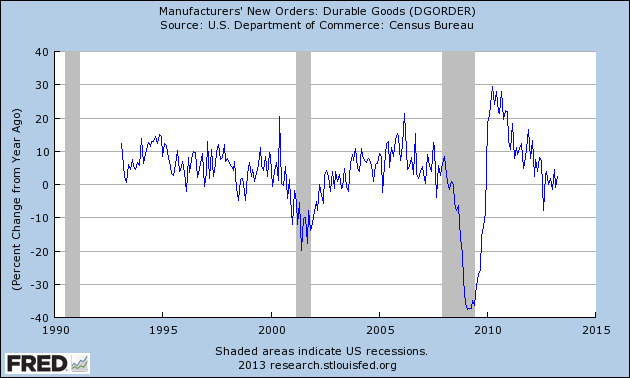 This entry was posted in Economic Forecasts and tagged ECRI on May 31, 2013 by Ted Kavadas. This entry was posted in Economic Forecasts and tagged Economic Forecasts, economic indicators, STLFSI on May 31, 2013 by Ted Kavadas. 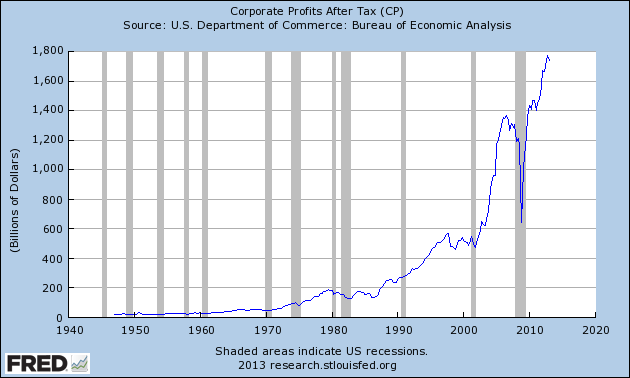 In the last post (“1st Quarter Corporate Profits“) I displayed, for reference purposes, a long-term chart depicting Corporate Profits After Tax. This entry was posted in Business and tagged Business on May 31, 2013 by Ted Kavadas. 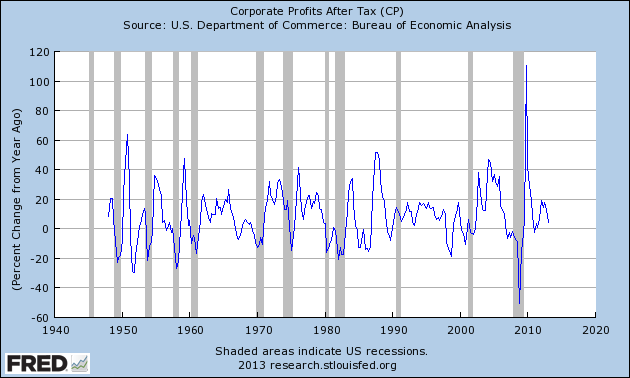 Today’s GDP release (Q1, 2nd Estimate) was accompanied by the BLS Corporate Profits (preliminary estimate) report for the 1st Quarter. This entry was posted in Business and tagged Business on May 30, 2013 by Ted Kavadas. Doug Short, in his May 29 blog post, titled “Real Median Household Incomes: Up .5% in April But Only a Fractional .6% Year-over-Year” produced the chart below. It is based upon data from Sentier Research, and it shows both nominal and real median household incomes since 2000, as depicted. As one can see, post-recession real median household income (seen in the blue line since 2009) is especially worrisome. As the excellent data from Sentier Research makes clear, the mainstream U.S. household was struggling before the Great Recession. At this point, real household incomes are in significantly worse shape than they were over three years ago when the recession ended. This entry was posted in Uncategorized and tagged Household Income on May 30, 2013 by Ted Kavadas. 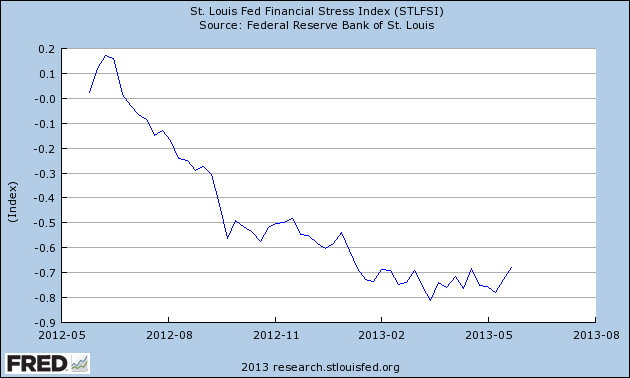 This entry was posted in Uncategorized and tagged economic indicators on May 29, 2013 by Ted Kavadas. 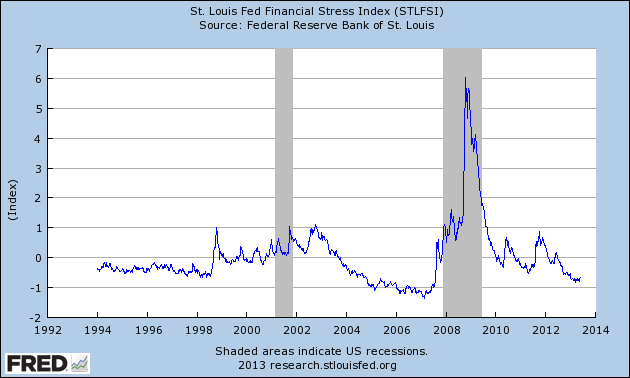 This entry was posted in Uncategorized and tagged Consumer Confidence on May 28, 2013 by Ted Kavadas. 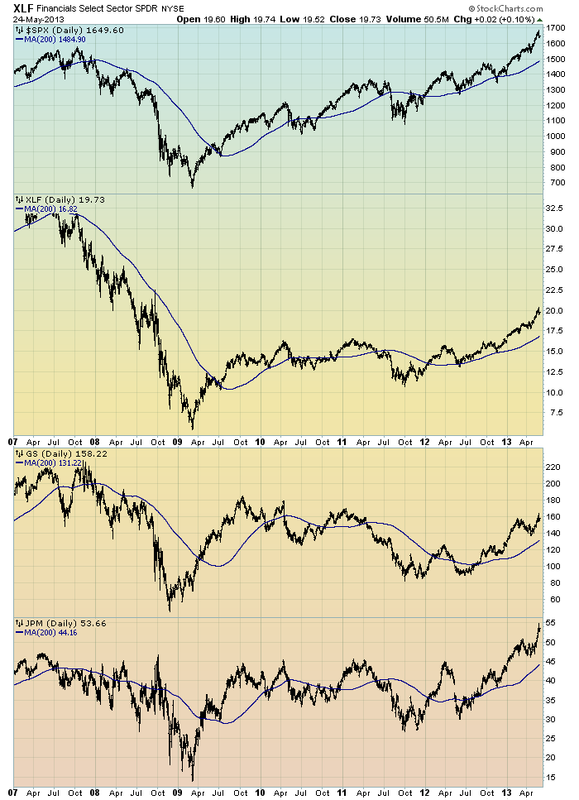 On June 29, 2011 I wrote a blog post titled “Financial Stocks – Notable Price Action.” This post is the latest update of that message. Although financial stocks have (in general) increased in price since 2012, I continue to believe that the longer-term “price action” of various financial stocks is disconcerting. I view the poor performance of these financial and brokerage stocks to be one indicator among (very) many that serves as a “red flag” as to the financial markets and economy as a whole. This entry was posted in Investor, Stock Market and tagged S&P500, Stock Market on May 28, 2013 by Ted Kavadas. The above chart is depicted on a daily basis, LOG scale, since 2007. On each of the three plots, a blue line depicts the 50dma for perspective. As one can see, there has been an interesting progression of the relative price of the XLF (Financial SPDR) vs. the S&P500, as seen in the top of the chart. 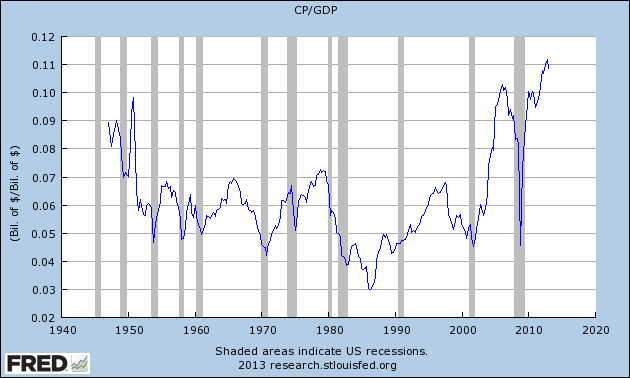 In the middle of the chart, the same can be seen in the $XBD (Broker/Dealer Index). Generally, since mid-2009, the price of both the XLF and $XBD have been on a slow downward trajectory relative to the price of the S&P500. The S&P500 is plotted on the bottom of the chart. In my experience, any time the financials lag the general stock market for a considerable period, it is generally a “red flag” that should be closely monitored. Below are three long-term charts, from Doug Short’s blog post of May 24 titled “Recession Watch: ECRI’s Weekly Leading Indicator Up Slightly.” These charts are on a weekly basis through the May 24 release, indicating data through May 17, 2013. 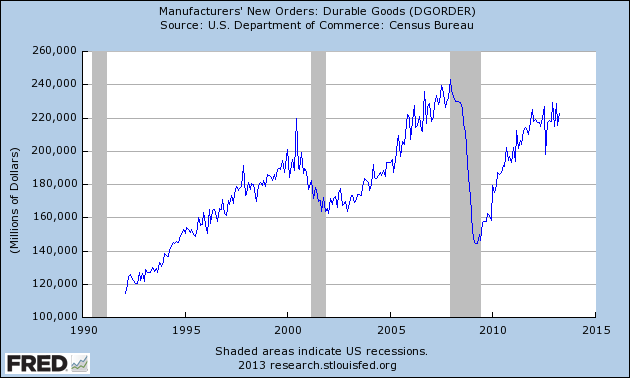 This entry was posted in Economic Forecasts and tagged ECRI on May 24, 2013 by Ted Kavadas.